Florida Gators: Due to popular demand, the Gotham Gators, the official University of Florida Alumni club for NYC, host game watch parties at four locations including a new venue for 2018: The Tailor. Also Sidebar in Manhattan and Roebling Sporting Club in Brooklyn. Sidebar: 120 E. 15th St. (Irving Pl.) New York, NY. (212) 677-2900. Georgia Bulldogs: The NYC Dawgs headquarters is at American Whiskey for football viewing parties. This season, they have added a second, family-friendly viewing location: McHale’s. The New York Metropolitan chapter of University of Missouri Alumni will host Mizzou watch parties this year at Raise NY (f.k.a. The Hill). The NYC Gamecocks meet at The Mason Jar. Every TV, including audio, is dedicated to Carolina. The Metro Vanderbilt Alumni club will be watching at Blind Pig. Blind Pig: 233 E. 14th St. ( between 2nd & 3rd St.) New York, NY. (212) 209-1573. The Greater New York Chapter of the Alabama Alumni meets at The Ainsworth in Chelsea. The NYC Chapter of the University of Arkansas Alumni Association watches at Gatsby’s. LSU Alumni Association hosts the official alumni game watch party at Legends. Bourbon Street, a New Orleans themed restaurant & bar on Restaurant Row, welcomes all New Orleans and LSU fans year round. 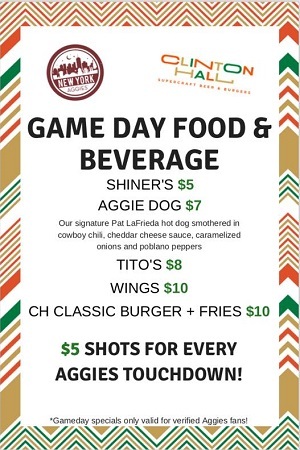 Texas A&M Aggies: The New York City A&M Club are hosting game watch parties at Clinton Hall 36 (formerly Suite 36). Clinton Hall 36: 16 W. 36th St. (between 5th & 6th Ave.) New York, NY. Avenida Cantina in the East Village welcomes Aggies supporters for all game viewing. (This is not affiliated with the NYC A& M Club). The Ole Miss Club of New York has a new location for 2018: Overlook. The New York chapter of Mississippi State Alumni has a new game watch location for 2018: The Junction in Times Square.